BPM, Virtual Percussion Synth from MOTU. 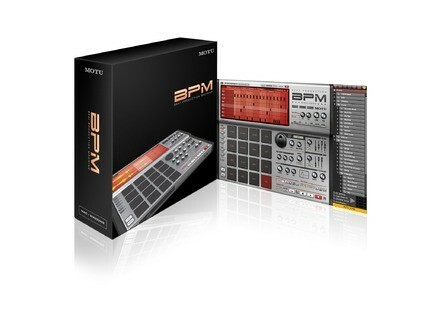 BPM (Beat Production Machine) is compatible with Windows Xp ,Vista , 7 and Mac OSX. I haven't encountered any problems regarding the help manual, everything is pretty well explained and the functions are easily accessible. The general configuration is great,everything works fast and the interface easy to follow and use. The software performs well without using a lot of cpu resources and it provides some great balance between the human touch and the pc programming of the drums. The gear is very stable, I hadn't had any errors working with it. I've been using for about 1 month, and I gotta admit it works very well , I've used this machine more in my pop , rock composition. What I like most about it is the feel that this drum induce which are some classic drum machines of the 80's and 90's. I like a lot the library provided with it, which consists on 15 gb of pure drums , it has a drum machine-style operation with advanced virtual instrument that allows your creativity to reach a higher level. This product has over 10,000 individual samples , over 1,000 new drum and percussion loops that have a 24-bit 96 kHz audio quality. It also contains over 200 drum kits + patterns , over 100 urban multi-sampled instruments , some great comprehensive percussion samples, patterns and loops. Another great aspect of this product is that is has 64 pads per scene , great controls to mute , solo , change velocity , etc . My opinion about the value of price is very good , this product comes with a vast library that allows to make something unique and it costs only 300 $. Knowing what I know, I would buy this product because it's one of the best drum sequencing I have ever tried. The MOTU BPM is a production software that comes loaded with 19GB of sounds, a whole bunch of effects and you can sample right in the software. You can run it on your PC or your Mac, if you are using it on a PC you need to have XP, Vista, or Windows 7 either 32 or 64 bit. If you are on a Mac you need to have OSX 10.4.11 or higher and a G4 or better with 1GB of RAM. If you use MOTU BPM with ASIO drivers you will have very good playback and glitch free low latency usage. But without ASIO drivers depending on what you system specs are you could experience some issues with latency and glitch like behavior during playback. Though it is very easy to install, the program is much bigger than expected and it can eat up your CPU quickly. Especially when you get into processing all of the effects, you will almost have to be using an ASIO driver in order for it to play smoothly. One of the worth the money features , are that you have an unlimited FX slots per rack, so you can just start stacking those effects up on top of each other and get some really cool sounds, but like I said if your drivers are not under control you will not be stacking too many effects together before you start to experience choppy playback. This software is good, and it comes at a decent price. I just did not have a need for it so I never used it after the first few initial times. It does come loaded with a lot of synth, bass, and drum sounds. It is also ready to go right out of the box. No hard set ups or anything like that, the manual that comes with it is pretty thin, but it helps you a lot if you need it. Hendricks97's review (This content has been automatically translated from French)" Yes ... but apparently NOT! A beta version sold as an app!!" The installation is done it without problems? I do not know about mac being under windows. I installed windows xp and under seven. Some constraints forcing them to copy shortcuts bank's 17 gigabytes in the same folder as the dll ... anyway! It could have been easier but it is not dead! The general configuration is easy? Former user mpc, configuration seems familière.on sees when entering the details that is far from the last mpc.Il flexibility is very simple to create a pattern with excellent sound bank available to the app that in fact also one of its main interests. MPc early on, we were limited in the visual editing pattern and song because the screen is permitted pas.15 years after the UVI developers have seen fit to keep the same visual impairment probably to keep in mind! More use standalone is very limited and does not allow to use other vst internally. Example to put a UAD compressor on an internal bus you need to open bpm bpm vst in your DAW! Have you experienced any incompatibilities? A mess on PC! Again I do not speak for mac that I used pas.Des bugs in series. The undo is very random, it is better not to make mistakes or deleted by mistake. The (very practical in appearance) editing functions are not reliable and notes shift them even as sseions becomes "loaded" (about 7-8 patterns). Basically you play a groove and elements of tempo hero finds no apparent reason at the next login! The "loop" function to carefully cut the samples can only be used with the mouse scroll. Jai .. mouse logitech marble mouse is not recognized and I have to change my mouse if I want to use the magnifying glass! Adding layer to the stacker is more hazardous sound and you will often uncheck the "edit all layers" option which joins the same treatment to all samples and that "Récoché" reasons alone without doing so you lose the affected settings chacque has added to its layer! All this causing great loss of time, to repeat what has already been done and loss of spontaneity! I pass and best. The manual is more than necessary for the installation, for the rest we do not learn much! .. We know that a filter is used to filter, that eq equalize etc. ..
BPM is somewhat greedy May it is understandable given the number calculations to manage. The idea of ​​this software is very good on paper and I've been able to do with many projects (not without difficulty) with BPM. However developers have literally abandoned users with their app that seems to me to be a beta version, a demo they sell and continue to sell (very expensive in terms of innovation competition, Maschine, Fl Studio!) With too many bugs! An update is required CONCRETE with optimization in publishing as I said the app could be very well without all these defects causing loss of time so it is better to actually lose in the long learning another "step by step". In anticipation of a serious update, If you are looking for something simple and intuitive works on, go your way! hugzz's review (This content has been automatically translated from French)" one mpc software"
Have you encountered any incompatibilities? Slight problem with ProTools sync .. when I start playback from the beginning of the session and that BPM is on a track, it is shifted minutely, so I have to place my cursor to a position before pressing play. Even with ProTools, when the cursor is placed on some grid lines, BPM does not start .... we must shift the cursor again. What is the configuration of your computer? The software works he correctly on this configuration? Well, I do not remember BPM crashed one day. This software + hardware is stable? Provided its bank is huge! Super intuitive, if you have an idea in mind can recreate in minutes, ready made kits are efficient and well organized, you can navigate easily to change a sample and you can assign controllers (MPD32 for me) easily . The effects are effective and some mixing is very well designed, you can easily assign as 16 mix outputs for each sample in a sequencer. Requires iLok ............ we say that this is not a problem but when you find yourself wanting to call / listen to one compo someone and not on its own ba iLok just can not! and we say that there really is not practical! I liked the samples of the bank are in the. Wav to be used outside BPM .. Lack of integrated sidechain compression (I think) to add a sub kick correct. A good case with which we can go far! With experience, you do again this choice? ........ I'm trying to get away from products that require a iLok to never be bothered. I hesitate with Maschine that looks nice thanks to its dedicated controller. Anonymous 's review (This content has been automatically translated from French)" Collosse with feet of clay (PC)"
3 / Incompatibility: So is the big downside to this software on PC, bug ca at each session, one of the reason I have not tried the song mode ... it's a shame for a software of this quality. Well apparently it runs on Mac so great ... it are the problem on PC? 4 / Manual in English but very comprehensive and detailed. Performance is well below the quality of the software and printing veloce it generates. The software does not work properly ... alas ca bug each session on a PC ... if it starts to work it must do the bare essentials and quickly filter that is to say his record his drumkits ... then quickly recorded the sequence for I assure you I am bitten owe more than once ... In fact it is necessary to be constantly registered tranqille work constantly when I say it really has any new change. For two years I have .. I did the acquisition of an Imac so I'll install it soon. I have not try before ... a little from my MV and my Mpc 1000. What I like most about this software is the huge possibility of synthesis ... you can enter any drumkits "average" in and do something big .. I like her a lot sequence that closely resembles that of an MPC. The value for money is reasonable I would say I paid 329 euros a time .. a little under Save rather than buying an MPC. It may seem paradoxical, but the choice I would do your eyes close .. The best software any category ... editing ... .. the sequencer synthesis ... Not to mention the new sound banks UVI Soundsource that the we just add .. wow ... frankly this software is designed to cross the decades. Even the MPC studio that will release soon is not the standard of MOTU BPM. MPC studio mashine ... ... more than expected MOTU develops its control surface which would enormissime! ThisIsTheSky's review (This content has been automatically translated from French)" A virtual MPC first choice!" This software is not very greedy in CPU power and turns easily on my iMac in 2009. I use BPM for two years. This resort is a perfect virtual MPC. A station that can cope groovebox beats evolved in an easy and intuitive. Compared with Maschine I know well, BPM is more efficient and better designed. The engine is very advanced and groove is used to treat every detail. Ergonomics screen is perfect. The samples are loaded easily drag & drop (drag / drop). If BPM does not provide chip is dedicated to a way of Maschine, it can easily integrate any of your existing controllers. BPM does not claim any one as Maschine, it focuses on the beat and the groove area and is used to make better and faster than its competitor. The bank's home since version 1.5 contains a comprehensive library of drum machines of the past. The original bank in turn, is more access bcp Rap as minimal techno of Berlin. But BPM eat anything you want to give it. 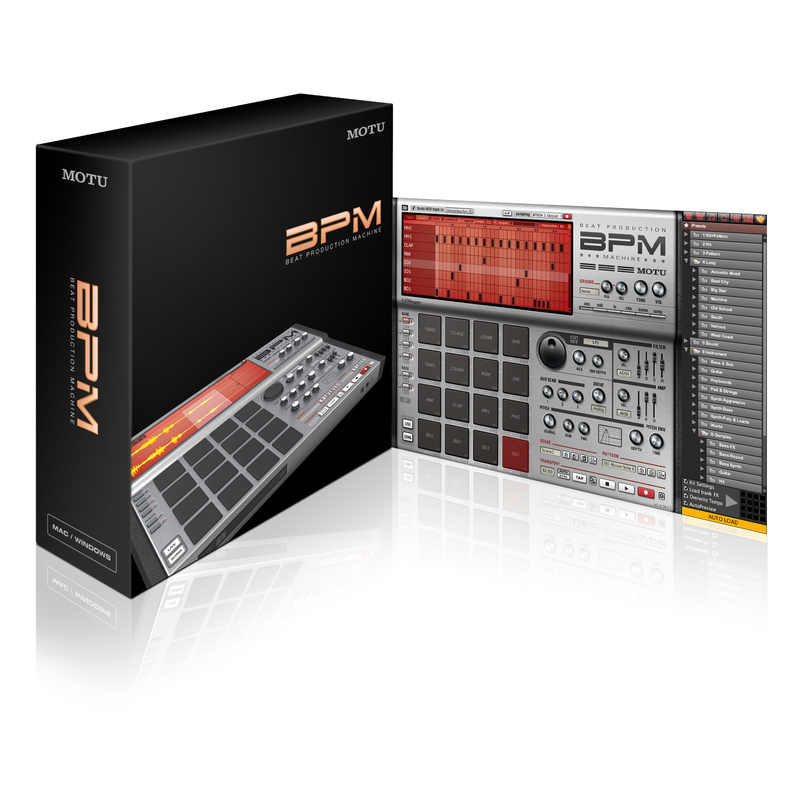 To summarize: BPM is a virtual groovebox first class, capable of composing beats a professional high speed "V", with its intuitive tools and ergonomics perfectly thought. One who already has a MIDI controller or the one who appreciates the comfort of a computer screen should consider BPM. Chris Darkers's review (This content has been automatically translated from French)" Excellent product"
- The installation is done it without problems? Yes not very complex but a bit long to install. It takes a key ILOK that sometimes update. - The general configuration is easy? - Have you experienced any incompatibilities? Not anything special apart from some bugs, but since 5.1 it runs better. Yes, for my part I am french manual is very detailed and for once not on CD should be reported as it becomes scarce. - What is the configuration of your computer? - The software works he correctly on this configuration? -This software + hardware is stable? - For how long have you been using it? - Did you try many other models before getting this one? - What thing do you like most/least about it? -What is your opinion about the value for the price? Purchased a year ago, after the first update everything is nikel, the engine is by far the best I have done motu! Very stable mode sp 1200 gouramnd if a little on the four banks, for example! For a year, he always replace my other plug (Kontakt, SampleTank, battery, stylus even though it is not the same style)! Super ergonomic, clear, efficient, high quality sound, built-in effects (creative) excellent! I would do this choice no doubt! the first: ilok! I have lost my key ahantise with my licenses (Softube, motu, waves ..) and I do not think it's normal to pay for prroteger is made of soft pays! I try biensur mashine, which very good but part of BPM software is far! No problem installation manual very clear, no incompatibility. Pc dual core 1.8 GHz Intel, 2 gb ram, sound card m-audio firewire 410, everything is stable and yet javai heard rumors about pcs. Jai updater to version 1.4 and everything is niquel now jai checker somewhat instruments its a bit slow but good instruments are indeed rotten bpm has not used it is used to make AC the drum and the drums on this software are outstanding !!!!! first quality! I the User for 3 weeks and it happens all at once a big sound especially hip hop, javais machine already and neither reason 4, the bin bpm it rocks heavy wood lol, great beats, beautiful drums. I do it again because this election being about 5 and possessing full cubase vst at least I dont need me to rewire with Reason, I produce everything in cubase with ease. the beats sound heavy right now. 269th for ca mpc will ! !